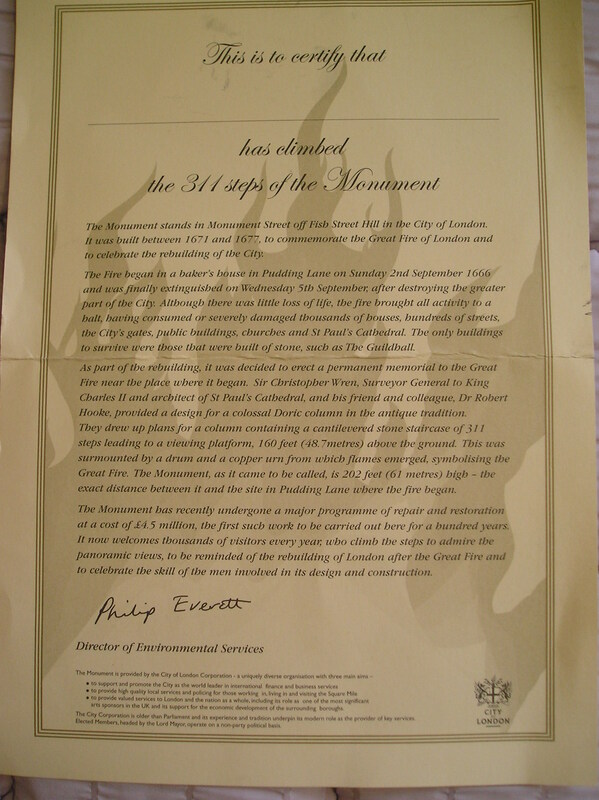 This is to certify that…………………….has climbed the 311 steps of the Monument. 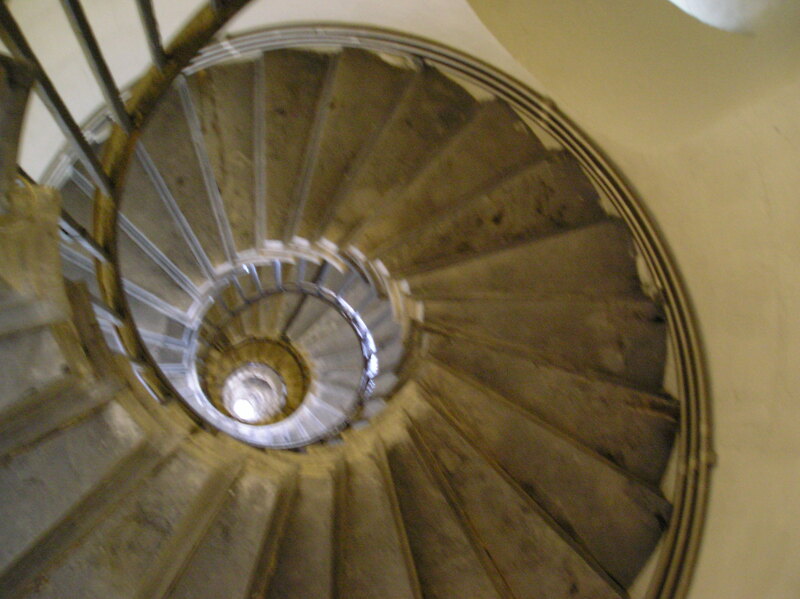 After the dizzying and arduous climb of those 311 steps that circle 160feet (48.7metres) up in an ever tightening spiral to the viewing platform of the Monument, when you return to the bottom you receive a certificate to prove that you have indeed made it to the top and back. And quite rightly too! an ever tightening spiral of stairs going up!!! on Monday last I went #walkabout again as mentioned in a previous post. My number one priority was to visit the Monument to gather information and photos for a piece I am doing. Here is the story of the Monument. 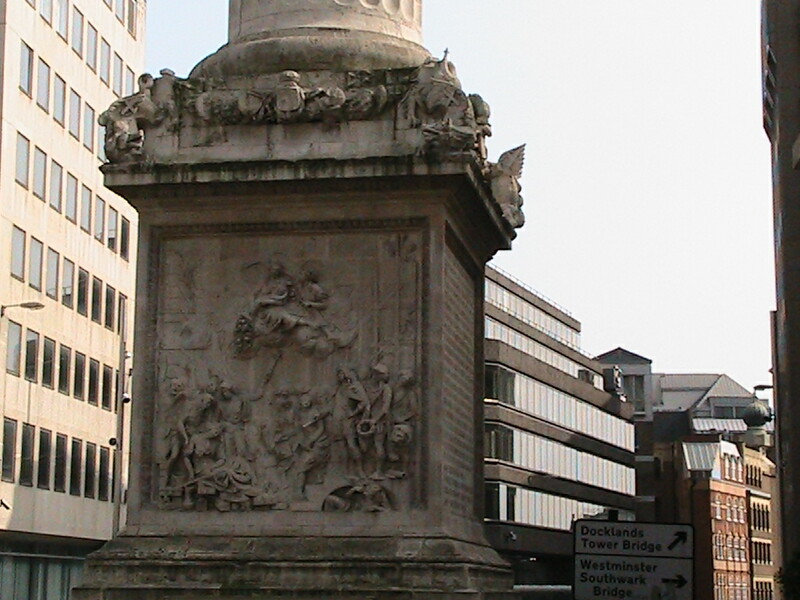 The Monument stands in Monument Street off Fish Street Hill and Pudding Lane in the City of London. 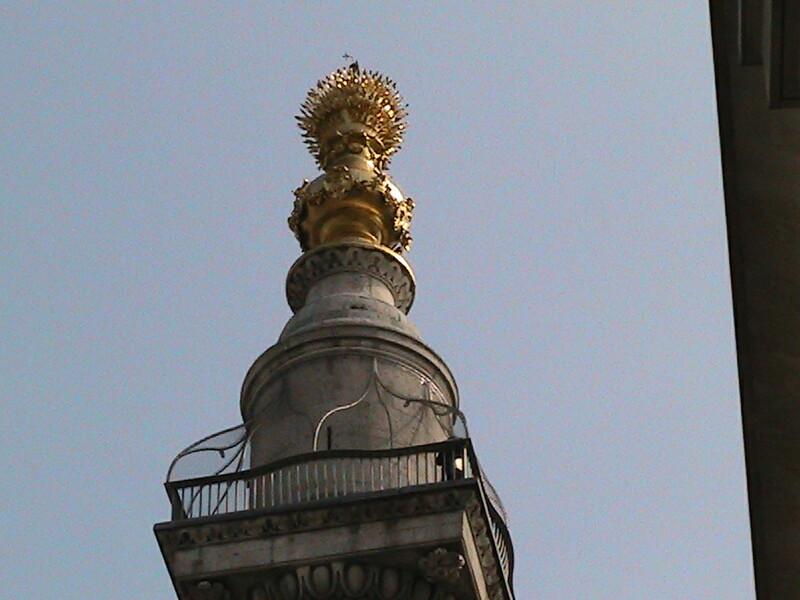 Designed by Sir Christopher Wren and Robert Hooke, the monument was built between 1671 and 1677 to commemorate the Great Fire of 1666, the Monument is the tallest free standing monument in the world. The Great Fire of London 1666 began in a baker’s house in Pudding Lane on a Sunday in September 1666. The fire burned for 3days from the 2nd September till it was finally extinguished on Wednesday 5th September, by which stage it had destroyed the greater part of the City. 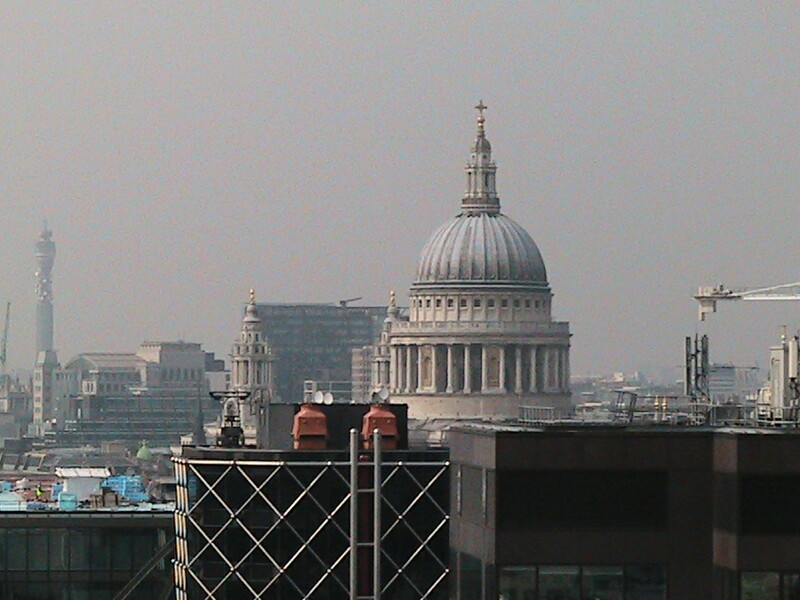 The fire brought all activity to a halt after having consumed or severely damaged more than 13,000 houses, hundreds of streets, the City’s gates, public buildings, Churches and St Paul’s Cathedral, in all 436 acres of the City. Amazingly there was little loss of life and a very interesting account of the fire can be read in the diaries of Samuel Pepys. The only buildings to survive were those built of stone, such as the Guildhall. Sir Christopher Wren was commissioned by King Charles II to erect a permanent memorial to the Great Fire of London near the spot where it started……Pudding Lane. 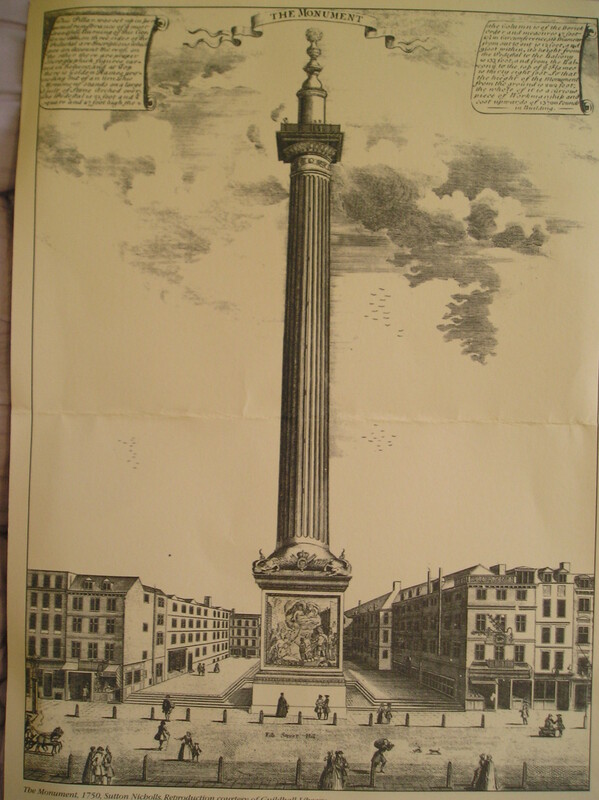 The Monument, a colossal Doric Column in the antique tradition, contains a cantilevered stone staircase of 311 steps that lead to the viewing platform, surmounted by a drum and a copper urn from which flames emerged; symbolising the Great Fire. 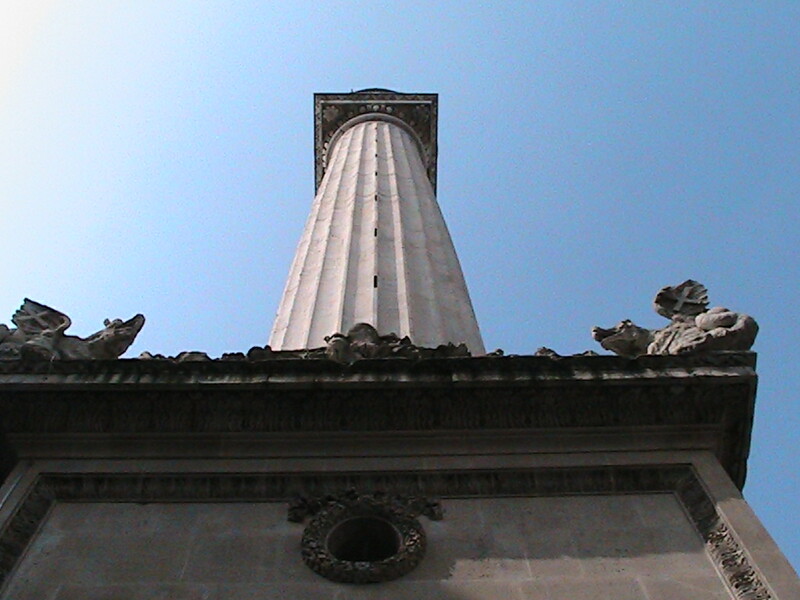 The Monument is 202feet (61metres) high, (30 feet taller than Nelson’s Column). 202feet is the exact distance between it and the site in Pudding Lane where the fire began. Be sure to study the fabulous carvings on the square base of the monument. on the base of the monument are some fabulous carvings. The monument originally housed a telescope, and scientific experiments were conducted there. St Paul’s Cathedral – dome, the Gerkin (Swiss Re building), Lloyd’s Building, in the distance you can see Canary Wharf, Tower Bridge, HMS Belfast, The Shard (a new building that at the time of writing is being built near to London Bridge in Southwark, Tate Modern, London Eye, and a great number of our more modern buildings in Bank. Bank – a brisk walk will take you into the centre of London at the Royal Exchange and Mansion House. The Thames Path – a short walk will take you to a point where you can pick up the Thames Path on the north bank for a really interesting walk past old and new buildings, pubs and cannons, historical sites, under bridges and through tunnels. It never ceases to give me a thrill when I visit these places. To think that I am walking in the footsteps of Christopher Wren and many other notable personages over the years…… as well as the less notable! On the day that I visited the monumnet was crowded as usual and it’s a tight squeeze on what is a very narrow ledge. It’s probably a good thing they have the wire mesh, as someone would be likely to fall off. As I was leaving a group of about 20 schoolchildren were ascending and it was a real laugh trying to squeeze past on the way down, esp at the top of the spiral staircase that gets narrower the higher it gets. Bless….one little poppet was screaming her head off with fear, stuck about a 3rd of the way up, refusing to walk one more step and not happy. The noise in the narrow confines was deafening! I do count myself so very lucky that I am able to visit these places and can’t imagine that many years ago in my very distant past I used to say that I had no interest in visiting London! I must have been mad!